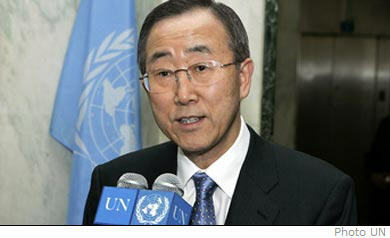 Newly appointed UN Secretary General Ban Ki-Moon will visit the DRC for the first time at the end of January 2007, as part of his first overseas trip as UN Secretary General. Mr. Ban will visit the DRC before going to Addis Adaba for an African Union summit on January 30. At a press conference on January 11 last in New York, he said that he was "looking forward to seeing at first hand the gains made in the DRC, a country that is key to so much of the future stability of the [Great Lakes] region." Mr.Ban, 62, who is from South Korea, has 37 years of political experience, and was former South Korean Minister of Foreign Affairs and Trade, serving in many countries worldwide. He replaced Mr. Kofi Annan from Ghana, who stepped down in December after 10 years at the helm of the United Nations, a Secretary General who was always a great supporter of UN peacekeeping involvement in Africa during his time in office. During his stay in the DRC, the Secretary General will meet with the new president Joseph Kabila, as well as representatives from DRC’s national authorities. He is also expected to travel to eastern DRC during his visit, in order to “meet peacekeepers, and express my personal gratitude for the contributions they are making under difficult and often dangerous conditions,” Mr. Ban said at a press conference in New York last week.